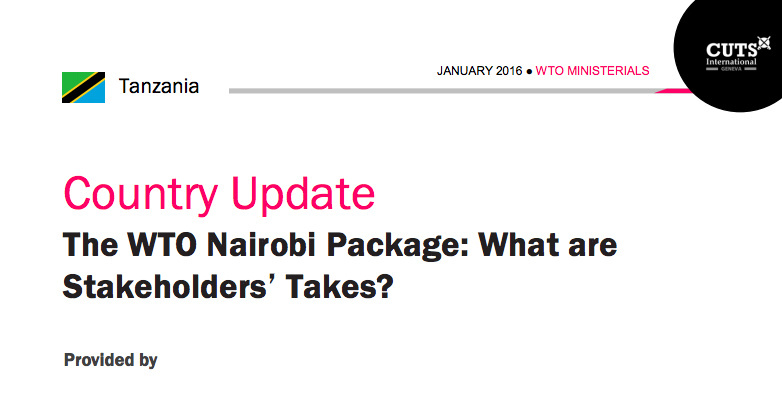 The WTO Nairobi Package: What are Stakeholders' Takes?. The Tenth Ministerial Conference (MC10) was held in Nairobi, Kenya from 15-18 December 2015. This was the first time, since the establishment of the World Trade Organisation (WTO) in 1995 that a Ministerial conference is being held in Africa. It should be borne in mind that the Ministerial Conference is the topmost body of the WTO under the governance structure set up by the “Marrakesh Agreement Establishing the WTO”, and has the authority to take decisions on all matters under any of the Multilateral Trade Agreements. Ironically, the MC10 was held in Africa at a time when there is a growing political division over the continuation of stalled Doha Development Agenda (DDA) negotiations, as well as the uncertainty over the negotiating function of the WTO. The slow progress of the Doha round has resulted to the multiplicity of mega regional trade agreements.